As geeks, we are passionate about the things we love – especially movies & franchises. With that comes the ability to be fanatical about things we dislike, and we can get really creative in expressing the hate. In the Star Wars fandom, very few things can get a geek riled up more than the words “Ewoks” or “Jar Jar Binks”. Sure enough, over the years I’ve seen the hatred for these two expressed in different ways, ranging from the Robot Chicken Star Wars special featuring Boba Fett mowing down Ewoks or a fan at a convention holding a serving platter with Jar Jar’s head on it. Let’s take a closer look at these two points. To say these primitive little bears couldn’t take down an Empire is to also ignore storytelling and history. The underdog beating a powerful force or giant has been a common theme in storytelling for generations. Why? Because we love rooting for the underdog, especially when the “giant” is mean, tyrannical or evil. Stories like those also inspire us to believe in ourselves and help us understand not to doubt ourselves against what might seem to be insurmountable odds. Stories like Lord of the Rings (A little Hobbit saves the world against those evil forces?) and Odysseus vs. the Cyclops (little men vs. the giant, man-eating creature) or John Rambo taking on an entire army are prime examples. Okay, the Rambo one perhaps isn’t the best example. However, it does lead me to my second point. How many times in history (even recent history) has a powerful military force gone into another country’s backyard and had a hell of a time winning the battles? In reality, the Afghans didn’t need Rambo. They defeated the Russians themselves with one of their most powerful weapons – the knowledge of their home terrain. The Empire fell prey to that in Return of the Jedi. The Ewoks knew that forest forwards and backwards. Plus, they knew how to create weapons out of stones, ropes, sticks and trees to attack troops and destroy an AT-ST (something the Rebels had a terrible time attempting to do on Hoth). I think the American Revolution is also a great example. In that case, the Americans were the Ewoks and the British were definitely considered to be an empire. We know how that turned out. When it comes to Jar Jar Binks, I understand some of the complaints. He’s not always easy on the ears when he speaks and he’s sometimes overly slapstick. However, he still has a legitimate place in the Star Wars saga. We all know that Star Wars is deeply rooted in myth. Jar Jar Binks mirrors mythology’s The Fool in The Phantom Menace, but he also is a key element within the themes of the film. We hear Obi-Wan talk about a symbiont circle in which a set of disastrous events would equally impact both the Gungans and the Naboo. If the two sides couldn’t put their differences aside for the greater good, their societies wouldn’t survive. Even though Jar Jar is a clumsy, silly & sometimes irritating being that has been banished by his own people – he still has a purpose and his existence has meaning. In this case, he ends up being the catalyst that brings the Jedi, the Naboo and the Gungans together in order to fight off the invasion of their homeworld. Another common complaint I’m continuously stunned to hear is that the Ewoks and Jar Jar were made for kids. Well, even though I just explained how it goes way beyond that…there might be an element of truth to the claim. As John Boyega recently said, “Get used to it.” In fact, you should already be used to it. When Episodes IV, V, and VI were produced, who were some their biggest fans? Kids (even before they created Ewoks). The prequels were meant to appeal to kids as well (and not just the kids-at-heart from the 1970’s and 80’s). I find it ironic that Robot Chicken created a scene where Boba Fett killed a bunch of Ewoks because I think some fans hate them and Jar Jar for not being as cool or badass as the infamous bounty hunter. This leads me to my last point – it’s a big galaxy out there and not everyone is going to be a great warrior, a character in a cool costume, a stellar pilot or someone who strikes fear in others simply by walking into a room. There are going to be marksmen as well as people who can’t hit anything. There are going those who are agile and graceful with a sword, and troops who can’t enter a room without bumping their head on a blast door. Most importantly, there are also those who will take you by surprise and make you think twice about judging them by their size. We’ve heard that before, right? If you’re not a fan of Jar Jar Binks or the Ewoks, this isn’t necessarily meant to change your mind. You have the right to be a fan of whatever you want and you may have some very solid explanations for everything. I’m just reminding you that those characters have the right to be in the Star Wars Saga for some good reasons of their own. Awesome! Thanks so much for this! All characters in Star Wars belong no matter what. As someone who appreciates both Jar Jar Binks and the Ewoks (I’ll toss little Anakin in there, too!) – Thank you! Very true. I often wonder what the haters see in Star Wars. “Cool weapons” “cool vehicles” is about it. They don’t even see the story. Jar Jar isn’t a terrible character, every fandom needs a source of levity. I think, for me, it would be more accurate to say he was a mismanaged character. George Lucas tried too hard with the comedy, and that’s a tricky thing. There was amusement in the predicaments of the characters. Here, the focus was on pure, deliberate slapstick, and that kind of humor should not be forced out of the story. He’s not terrible, but he should have been toned down. Expectations for Phantom Menace were quite high, and his antics may have been a bit much to soak up. My solution? Pull him off of Tatooine, and just showcase him on Naboo and Coruscant, let him have his big comedy moments in the final battle. I think fans would have appreciated him more if the comedy was at half of what it was. Good points, Jon. I agree about toning it down and about the way he’s written. The good news is humor wasn’t his ONLY purpose. Ewoks didn’t bother me one bit. I think they were used at a satisfying level, with just the right balance of drama and comedy, and made the final conflict on Endor end with a good vibe and energy. Not too cute, not too serious. They fit in a happy middle ground for me. Haters blame Jar Jar for Palpatine’s rise to power but let’s remember Palpatine was manipulating every one, including all the Jedi and yes – Yoda, too. Jar Jar was following Padmé’s lead – she, as Amidala is one who helped push Valorum out of power with the no confidence vote. Without Jar Jar there would be no victory on Naboo. He’s the one who told Amidala about the secret army and that his is a race of warriors. No one looked sadder at Padmé’s funeral. Just throwing that in there – none of these comments contain even an ounce of humor. Jar Jar is deeper than that. Love this, Scott! I am split on this subject. I love Jar Jar; the Ewoks, not so much! I actually really like the fact that they are David to the Empire’s Goliath, and they certainly are crafty little suckers. But I was 20 years old when Return of the Jedi came out, about to get married and entirely too cool to have the warm fuzzies about, well…warm fuzzies! At the time, I thought they brought the sophistication level of the saga down a few notches. Of course I was WRONG, but my tepid feelings for the Ewoks remain. Jar, Jar, however, is awesome and completely misunderstood. He is a walking, talking metaphor for all that lies beneath the surface of the deepening rift between the Dark and the Light in the GFFA…. I applaud thee 😉 Very well done and I loved every bit of this. See, I was 9 years old when I saw ROTJ in the theater and instantly fell in love with the EWOKS. It was a smart move by George to bring them to life. 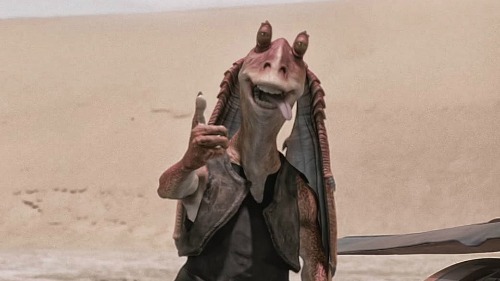 As for Jar Jar…he has always made me laugh and in a good way. He’s so full of life and I think he fills the positivity void that would otherwise be a continuous cycle of negativity.